Strong's Exhaustive Concordance of the Bible, first published in 1890 is a concordance of the King James Bible (KJV) that was constructed under the direction of Dr. James Strong. 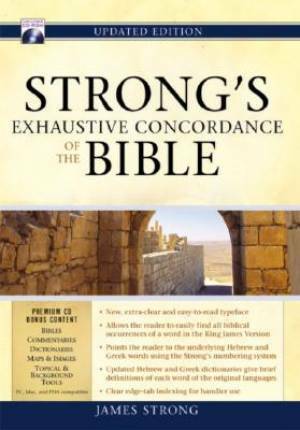 Strong’s Concordance is an exhaustive cross-reference of every word in the KJV back to the word in the original text. The purpose of Strong's Concordance is to provide an index to the Bible. This allows the reader to find words where they appear in the Bible. Strong numbered every Hebrew or Greek root word, for ease of reference. This numbering system which consists of 8674 Hebrew roots and 5523 Greek roots is now used in works by many other writers and is widely available on the web where it is used in conjunction with Wigram's Englishman's Concordances and Thayer's Lexicon. It has become the most widely used concordance for the King James Bible. Strong’s Concordance was constructed with the effort of more than a hundred colleagues. Since Strong's Concordance identifies the original words in Hebrew and Greek, Strong's Numbers are sometimes misinterpreted by those without adequate training to change the Bible from its accurate meaning simply by taking the words out of cultural context. Professionals and amateurs alike must consult a number of contextual tools to reconstruct these cultural backgrounds. Many scholarly Greek and Hebrew Lexicons use Strong's numbers for cross-referencing, encouraging hermetical approaches to study. This index allows a student of the Bible to re-find a phrase or passage previously studied or to compare how the same topic is discussed in different parts of the Bible. Strongs Concordance includes the original 8674 Hebrew root words used in the Old Testament and the 5624 Greek root words used in the New Testament. Each original-language word is given an entry number in the dictionary of those original language words listed in the back of the concordance. These have become known as the "Strong's numbers". The present work is entitled "The Exhaustive Concordance" of the text of the English Bible ordinarily in use, because it is the only one hitherto constructed that gives all the words of that book and all the passages where they are found; and in this respect no Concordance can ever be made more perfect. word was translated into the English word in the KJV Bible. Other authors have used Strong's numbers in concordances of other Bible translations, such as the New International Version and American Standard Version. These are often also referred to as Strong's Concordances. In its preparation three great features have been constantly kept in view, completeness, simplicity, and accuracy. It is intended to be a permanent standard for purposes of reference: so full in its vocabulary and lists that every one consulting it will be sure to find a passage easily and quickly, by seeking it under any word whatever that it contains; so plain in its arrangement that a child cannot miss his way in using it; so correct in its citations, both numerical and verbal, that the most scholarly may implicitly depend upon it. 5 In Shushan the citadel there was a certain Jew whose name was Mordecai the son of Jair, the son of Shimei, the son of Kish, a Benjamite. 6 Kish had been carried away from Jerusalem with the captives who had been captured with Jeconiah king of Judah, whom Nebuchadnezzar the king of Babylon had carried away. 7 And Mordecai had brought up Hadassah, that is, Esther, his uncle's daughter, for she had neither father nor mother. The young woman was lovely and beautiful. When her father and mother died, Mordecai took her as his own daughter. 8 So it was, when the king's command and decree were heard, and when many young women were gathered at Shushan the citadel, under the custody of Hegai, that Esther also was taken to the king's palace, into the care of Hegaithe custodian of the women. For Hebrew word study, Stongs exhaustive search of Hebrew is the place to begin. The most accurate and complete Strong's ever published, the only Strong's compiled and verified by computer technology, the only truly exhaustive concordance to the KJV, and includes the most up-to-date Hebrew and Greek dictionaries for precise word studies. Strong’s is an indispensable tool that all readers of the Bible will want to have as part of their basic library. As it says in Exodus 20:11, the earth was made in 6 days. Where those 24 hours days, or figurative days? A clarification to parts of the above paragraph would be better described as Hebrew and Aramaic lexical entries; and Greek lexical entries, but note that there are closer to about actual entries, Note that modern lexical Old Testament systems currently separate out the Aramaic entries from the Hebrew entries, a practice done since at least the time of the early 20th century, as for example in Hebrew lexicon commonly known as "Brown-Driver-Briggs." The difference between a Bible Concordance and Strong's Concordance is that a plain Bible Concordance usually does not have references to the Greek or Hebrew text or include any Strong's numbers.